Applications development and iPhone programming are the complex processes that involve many stages. Some of them can be implemented quick and easy using the ConceptDraw DIAGRAM diagramming and vector drawing software extended with iPhone User Interface Solution. Let's simplify the process of iPhone programming, of designing the iPhone apps thanks to the libraries of iPhone User Interface Solution from the Software Development Area that contain ready-to-use vector objects of iPhone graphical user interface elements. The predesigned templates and samples of iPhone User Interface Solution also can be useful as examples and bases for your own iPhone apps designing, iPhone programming and developing. You can use the samples as is or change if needed, or fill the desired templates using the objects from the offered libraries. 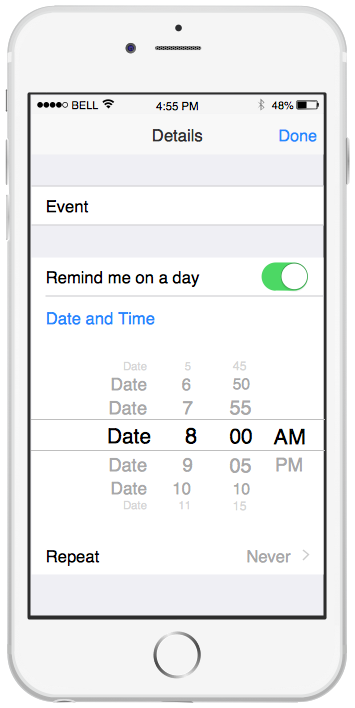 This template of iPhone Reminders was designed using the objects from the iPhone User Interface Solution libraries. It can be opened from ConceptDraw STORE where you can find also the set of other iPhone templates and samples. Use the iPhone User Interface solution for quick, easy, and effective iPhone programming.